In this video we are going to talk about flash cards. Now you may be startled to see wordless here, but the reason is I want to talk about word list first, to show you that you should think of them as your enemy. That's right word list are your enemy. Now, I know this is stark, bull. How can you say word lists are your enemy? Don't we have to study GRE word lists? The answer to that is actually no. Don't study GRE word lists. Why? Well, first off, because it's something called the positioning effect. This is the idea that one word or any given word is always next to another word, that is, there's one word before a word, and there's a word after any word. And so, what we, our brains start to do is memorize the positions of words. For instance, say I'm trying to learn the word abstemious. If I know it's next to the word abstruse, then I'm likely to remember abstemious. But if I just say, excuse me sir, what does the word abstemious mean, and you of course have been studying the word list. You may have no idea but when I say, it's the word next to abstruse. And you say, oh yeah the abstemi, oh that one, yeah, and then you define it. This happens all the time and that's why we want to avoid word lists. Another reason to avoid word lists is non-randomization. This is very similar to the positioning effect, but it's the fact that the words are always in the same place. Your brain is never startled to suddenly see a word next to another word. It's always predictable. 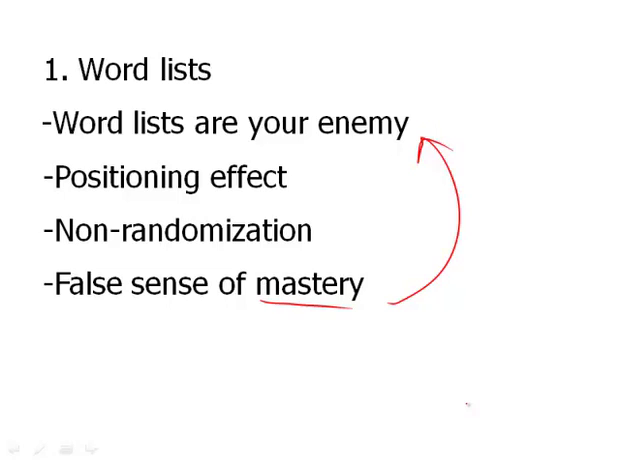 Now, what this leads to is a false sense of mastery, and that's why I started off by saying word lists are your enemy, because many people will study them despite this video. And they will get this false sense of mastery because as they read the word list, they will learn that the definition for the word. They'll look back at the word. They'll say it means such and such. They'll look at the definition confirm and move on this way. But by the end of the list, if I were to suddenly walk into the room, grab the list from them and then say okay, what does the definition of such and such mean? They won't know, even though they think they know, it's this idea that they knew because of the positioning effect and just because they started reading back and forth and it seems so easy to know the definition when you are more or less looking at it. So what would I do if I jumped in the room? I would give them a flash card that says abstemious on it and ask them to define the word. And that's because flash cards are far more effective than word lists. Now, why? Well, it goes back to non-randomization versus randomization. You are always going to be surprised by which word you see when you shuffle, move the flashcards around. You don't know what's coming next. Your brain is on its toes so to speak. And that's what makes flash cards so great. Now what could also make flash cards great, but it's not necessarily an intrinsic property of flash cards are example sets. So if you have any flash cards out there have example sentences. So that you're not just learning definition,and like a parrot, coughing up those definitions but you actually have a sense of context with example sets. Now drum roll, this allows me to talk about Magoosh flashcards because yes, not only do we offer definitions on our flashcards but we offer, and I'm kind of tooting the Magoosh trumpet here, but we offer these great example sets as to really help you see how words function in context. And there's over, over basically about 1000 flashcards, of GRE words that you are very likely to see on the test. And this is a great place to start learning. Now, I know that you may encounter other words that aren't on, that aren't part of this 1000 flash card deck. You may be, for instance, reading the New York Times, so if you ever stumble across words and want to keep them somewhere, check out quizlet.com, and you can make your own flashcards there as well. So that way with Magoosh flashcards and any extra ones, you're covering even more vocabulary bases. Finally: how do I use flashcards? It's a great question. You may say, okay, just take the stack and start picking up words and looking at the back and seeing what the definition is. It's a good idea to shuffle. Again, to always have that randomization component there. And a great little thing I have, or game if you will, is odd men out. So let's say you have a deck of 100 words and you're learning them. Once you've learned them, once you've gone through them you should quiz yourself. So let's say you quiz yourself and you notice that you miss about 15 maybe even 20 words. These become the odd men and these are the ones that you want to focus on. So now you focus just on these 20 words, and you learn these words, you don't just take the quiz right there and try to memorize them. But you actually really spend some time with these words, may be go out, great take the flash cards with you and then a few hours later requiz yourself on these off men and see if you've learned these words.